I am so excited to announce my new monthly feature - "Days of the Month". 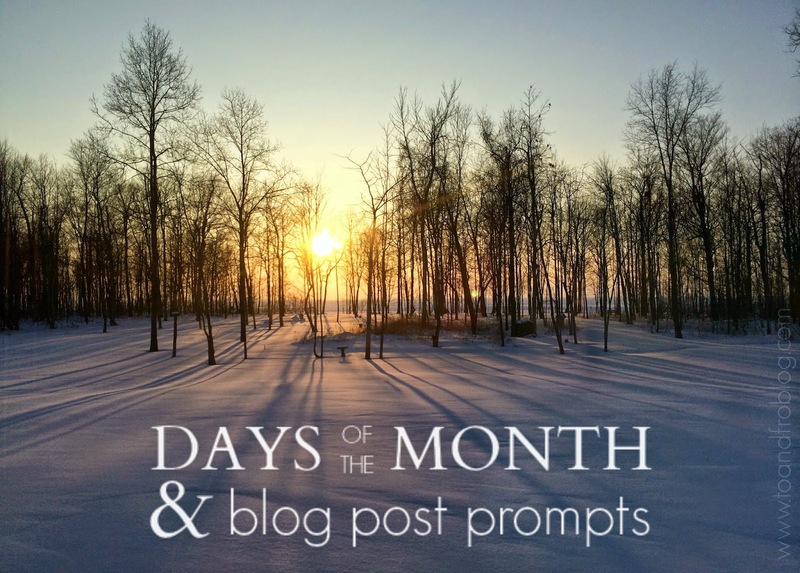 On the last day of each month, I will share interesting days of the month to come and include a blog post prompt for those days. Perfect for when the creativity is lacking. 1 - World Compliment Day: Compliment at least 5 people today and share. 2 - Fun Facts About Names Day: How did you get your name? 3 - Mulled Wine Day: Share your favourite drink recipe. 4 - Grammar Day: Do you have any grammar pet peeves? 5 - Cheese Doodle Day: What is your favourite junk food? 6 - Day of Unplugging: Take a break from social media, and then blog about how it felt. 7 - Be Heard Day: Tell a story that you want heard. 8 - Women's Day: Tell us about an important woman in your life. 9 - Get Over It Day: What is one thing you wish you could get over? 10 - Pack Your Lunch Day: Show us what's in your lunch. 11 - Registered Dietician Day: Share your favourite healthy recipe. 12 - Girl Scout/Guide Day: Were you a Girl Scout/Guide? Share your favourite memory. 13 - Open an Umbrella Indoors Day: Are your superstitious? 14 - Pi Day: Share your favourite recipe for something round. 15 - True Confessions Day: 'Fess up. 16 - Lips Appreciation Day: Lip stick or lip gloss? What's your favourite? 17 - St Patty's Day: Show us your green and gold. 18 - Awkward Moments Day: Share an embarrassing moment. 19 - Poultry Day: Share your favourite chicken recipe. 20 - International Day of Happiness: What makes you happy? 21 - Memory Day: What is your favourite childhood memory? 22 - World Water Day: What are your favourite water-related activities? 23 - Puppy Day: Tell us about your furry friend. 24 - Chocolate Covered Raisins Day: Salty or sweet? 25 - Waffle Day: What is your favourite breakfast recipe? 26 - Make Up Your Own Holiday Day: What and how would you celebrate? 27 - Quirky Country Music Song Titles Day: What is your favourite song? And why? 28 - Something on a Stick Day: Share your favourite fair food. 29 - Smoke and Mirrors Day: Do you know any magic tricks? 30 - Take a Walk in the Park Day: Get outside and enjoy the fresh air. Show us your local park. 31 - Crayola Crayon Day: Pick your favourite colour Crayola crayon and tell us why. What do you think about this new monthly feature? I love your dress as a day outfit! I am all about themed parties as well, will have to use some of these blog prompt ideas! What a great idea!! I'm excited to have this as a possibility to use when I'm needing some inspiration. This is a really great idea! I am loving all the different days! Love these ideas! Perfect place on a day of writers' block. These are great prompts! I know they're gonna come in handy for me. Writers block is no joke. haha. Thanks Mar! Love your list, Mar! I didn't know most of what's celebrated on a particular March day, so this sounds really fun!